a) English _________ in our school every day. Answer: English is taught in our school every day. Here, the sentence is in the passive form. If the students don’t have any idea about the rules of voice change, they cannot write the verb accurately. b) Many books___________ in the book fair last year. Answer: Many books were displayed in the book fair last year. In this sentence, the adverb ‘yesterday’ indicates that the verb of the sentence is in the past indefinite tense and the subject ‘books’ is plural. Here the ‘books’ don’t do any action. The action of displaying is done by the people who are hidden. First the students have to think whether the sentence is in the active or passive form. As we don’t find the people who displayed books, we have to come to a decision that the sentence is in the passive form. We have to think about the subject, the tense, the number, the voice and the past participle form of the verb. What auxiliary verb (to be verb) does a subject take in the past indefinite tense? Either ‘was’ or ‘were’. So, in example ‘b’ the subject books being plural, will take plural verb ‘were’ and the past participle form of ‘display’ will be used after ‘were’. c) Here, the verb ‘take’ is to be used in the gap of the following sentence. Some steps have ________to reduce traffic jam. This sentence is also in the passive form in the present perfect tense. Here, in this gap, we have to use ‘been’ after ‘have’ and then ‘taken’ will be used as the past participle of the verb ‘take’. Here, I have shown some examples of the right forms of verbs in the passive voice. Most of the students are often in a fix to use the verb correctly if the sentence is in the passive form. The verb must be related to the subject.If we fail to find out the subject, we cannot use the verb accurately. a. The quality of the mangoes is good. b. The quality of the mangoes are good. a. Salam along with his brothers are present. b. Salam along with his brothers is present. Here, (b)’ is correct because along with, as well as, with, and not, together with, must agree with the first (Subject). I would like to mention more examples of such mistakes. When we look over the answer papers of the terminal exams or public exams, we often notice such mistakes. b) Trees are planting every year. c) People are planted trees every year. d) We are polluted air in many ways. I think these are the major mistakes because they impede communication distorting the meaning of the sentences. The above four sentences are given below with the right form of the verbs. a) Mother is cooking rice now. b) Trees are planted very year. c) People plant trees every year. d) We pollute air in many ways. or, we are polluting air in many ways. I have an analysis to avert these unexpected mistakes. If any verb comes after am, is, are, was, were, be, been, it will either take ‘ing’ form at the end or its past participle form should be used. It depends on whether the sentence is active or passive. In these situations, ‘ing’ form should be added to the main verb if the sentence is in the active voice and the past participle form should be used if the sentence is passive. 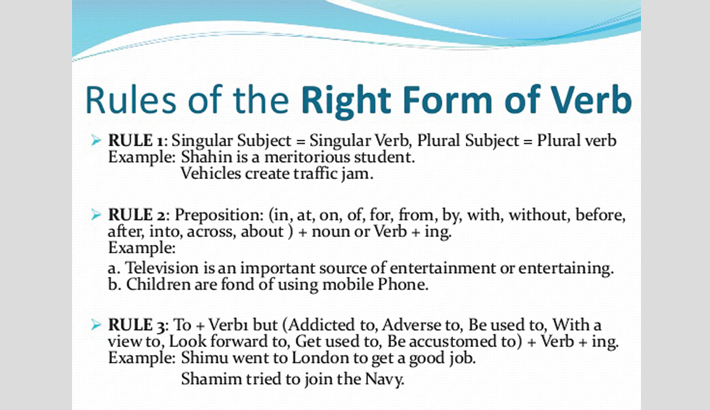 If any student remains aware of it, he or she can avoid the mistakes of verbs. The passive form of the Intransitive verb is normally not seen because an Intransitive verb generally does not take any object. So, the Intransitive verbs like ‘occur’, ‘happen’ are never used in the passive form. But many students often use these verbs wrongly. Wrong: Floods are occurred in our country every year. Right: Floods occur in our country every year. Wrong: The accident was happened yesterday. Right: The accident happened yesterday. A simple sentence contains only one finite verb. It may take more verbs but they will be non-finite. a) He became afraid seeing the tiger. Here, ‘became’ is a finite verb while ‘seeing’ is non-finite (present participle). b) Completing the work, I returned home. c) Going to school, I met the Headmaster. d) I go to the library to read (infinitive) books. If ‘dare’ and ‘need’ are followed by ‘not’, they become the modal verbs. In this case, if the subject is the third person singular number these two verbs do not take ‘s’ after them in the present indefinite tense. a. He need not go there. b. Mina dare not meet the headmaster. Unless these two verbs are followed by ‘not’, the word ‘to’ must be used after them. Examples: a) He dares to go there. b) Helal needs to do the work. One who is adept in the use of the right form of verbs, can write and speak English very fluently and confidently. But it is not intelligible to us why the authorities concerned have excluded this important grammatical item from the JSC exam.